Three years in the making, DEN’s $11.5 million display is possibly the largest airport entry sign in the world. Designers invoked traditional Colorado images—rivers, mountains and rolling hills—when creating the iconic front entrance, says David Bruce, Facility Services manager for the airport. 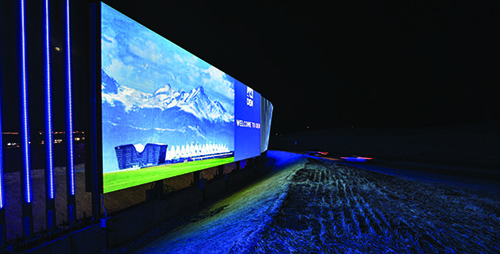 The attention-grabbing display replaces the static backlit sign DEN installed before the Democratic National Convention in 2008, and is seen each day by arriving and departing passengers, riders aboard the city’s new light rail line and people in an estimated 120,000 vehicles on the nearby tollway. The airport partnered on the project with Panasonic, which made a considerable local splash a few years ago by choosing to build the headquarters for its main U.S. innovation and sales hub (Panasonic Enterprise Solutions) in Denver. Plans for the company’s 400-acre development, located just 10 minutes from DEN, include 400 employees and a full “smart city,” complete with autonomous shuttles to the nearby light rail station. Local officials estimate the annual impact of the overall facility at $82 million, and Denver Mayor Michael Hancock said it could be the region’s biggest economic win in years. Panasonic Enterprise Solutions was formed in 2014 as an umbrella organization for the company’s divisions that develop and sell large-scale digital signage, solar power systems, and audio- and visual-technology products and services. DEN worked with Panasonic’s CityNOW team to develop and install its new welcome sign, a micro-grid energy storage system and smart LED streetlights for the airport. Concept planning for DEN’s new sign began in fall 2015. A whiteboard session with airport executives, the city mayor and Panasonic officials developed an initial drawing that is strikingly similar to what is standing in the ground today, notes Greenwood. The project team spent four months in concept mode, and then dove into the design phase. Approval for the final design came in late 2016, and construction began in late spring the following year, after final permits were secured and clear weather materialized. The mockup team fabricated 18-foot poles, painted them charcoal gray according to specifications for the final product and installed specially made LEDs from Hong Kong. After the sample system was complete, airport executives, Mayor Hancock, and representatives from Panasonic’s worldwide headquarters in Japan assessed the results. The LEDs used to create the sign are good for 100,000 hours in a perfect environment, but Denver’s weather can be downright punishing. With wind gusts of 70 mph, 300 days of sunshine and multiple feet of snow stressing the sign’s components, Greenwood predicts that adjustments will need to be made after five to seven years. The airport is responsible for maintaining the integrity of the electrical system that powers the sign and the grounds that surround it. Producing the poles that stand alongside the primary LED displays was particularly challenging, because they needed to curve at precise angles to create the display’s winding visual effect. Installers had to place each of the 908 poles perfectly, and every spot was surveyed to the finest detail, notes Bruce. “They aren’t popsicle sticks,” Greenwood adds. “These things are huge.” Specifically, each of the poles has a 5-inch diameter and is 18 feet long, with 15 feet protruding above the ground. Greenwood says that using the pillar approach, which emphasizes the importance of early stakeholder alignment, is was what made the unique project so successful. “If you don’t have that alignment in the beginning, it’s just an RFP [request for proposal] mentality,” he remarks. Fostering unity was crucial from the original whiteboard session in September 2015 to the sign’s final debut in November 2017. Key stakeholders included representatives from DEN, the city, Panasonic and multiple real estate developers. “They needed to be humming the same tune, but also understand that it was not going to be ideal throughout the relationship,” Greenwood explains. He likens the project to a marriage: After the initial proposal was accepted, the team walked down the aisle together and then produced something everyone was proud of. The airport will run advertisements to help pay for the sign’s installation and $3 million, 12-year maintenance contract. It also uses the new display to alert visitors and local citizens about free arts and entertainment at DEN. The airport’s free ice-skating rink has been particularly popular since it opened in November 2016. Greenwood agrees, noting that Panasonic was seriously considering five other major cities for its smart city project. “It was this partnership that allowed, and convinced us, to move to Denver,” he remarks.